Life just got a little easier and whole lot more stylish! You will get everyone's mouth watering at your next event when you arrive with your Blue Oyster Entertainer Insulated Food Carrier. 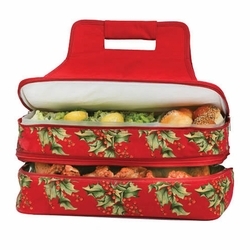 This delightful casserole carrier can accommodate an 11" x 15" (5QT) casserole dish and includes 2 large food containers. The 2 expandable sections are full size and can store either hot or cold foods. 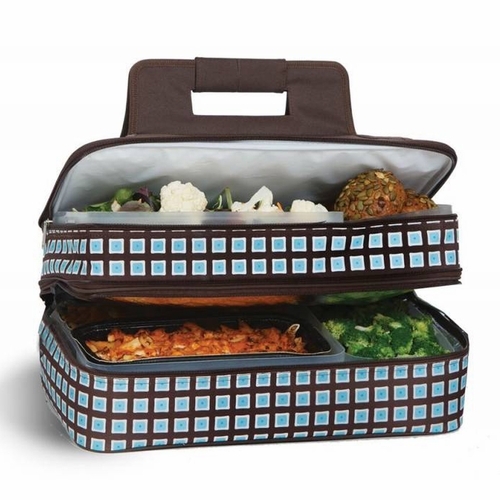 The top section has a waterproof, leak proof, liner and insulated liner perfect for beverages, condiments, salads and more. 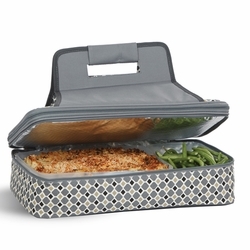 The lower section has thermal foil insulation for keeping hot dishes extra warm during your travel. Both sections feature a zippered closure and wipe clean easily. 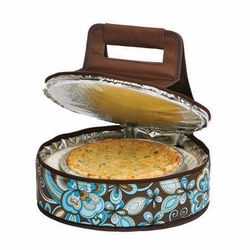 Utilize the hidden pocket to store serving utensils such as the matching Utensil Serving Wrap (not included).